"Lizzy Borden took an axe and gave her father 40 whacks; and when she'd seen what she had done, she gave her mother forty-one. "Numerous guests at the B&B have reported hearing voices of a woman softly weeping in the night. Some guests have seen shoes move across the floor, while others have had an older woman, in traditional dress, tuck them in at night. Lights flicker, video equipment is suddenly turned on and off and cameras work when no one is using them, but won't work when you expect them to. And always, the ghosts of Andrew and Abbey wander the house where they were murdered. 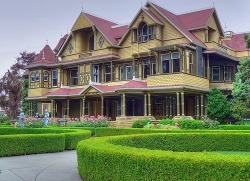 Sarah Winchester was the widow of the inventor of the Winchester repeating rifle. A medium told her that the souls of all those who were killed by Winchester rifles would come for her if she ever stopped building onto her house. Now this Mystery Mansion has doors that lead to two-story drops and stairs that go into ceilings! Not to mention all the ghosts! Perhaps the world's most infamous prison is kept alive by its brutal history and tales of spiritual visitations. During the day, the old prison is a bustling place, filled with tour guides and visitors... but at night, the building is filled with the inexplicable. 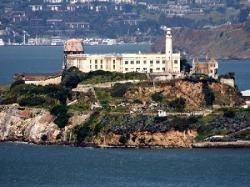 Many believe that the energy of those who came to serve time on the Rock still remains, that Alcatraz is an immense haunted house... a place where strange things can and do happen today! The first-class swimming pool is a popular spot for ghost sightings and is part of the Ghosts & Legends show, a daily, special effects, walk-through show created aboard the ship that dramatizes actual paranormal and historic events that have been reported over the years. Wet footprints mysteriously appear - and there is not a drop of water in the pool. Women in vintage bathing suits visit for a leisurely swim. Although the pool has been closed for more than 30 years. Is it real, or is it your imagination at work? Testimonials from passengers and crew members continue to be reported and documented, all of them wanting answers to what they've experienced. 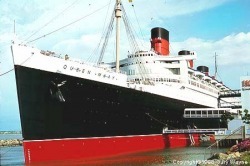 Do ghosts really exist aboard the Queen Mary? 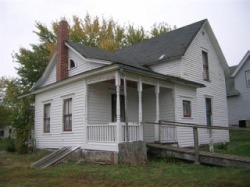 Her walls still protect the identity of the murderer or murderers who bludgeoned to death the entire family of Josiah Moore and two overnight guests on June 10,1912. Almost 97 years later, her secret continues to draw many visitors to her door. 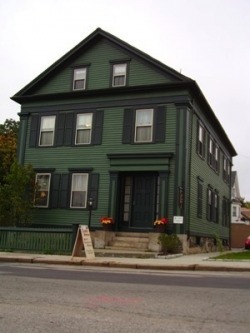 Visits by paranormal investigators have provided audio, video and photographic proof of paranormal activity. Tours have been cut short by children's voices, falling lamps, moving ladders and flying objects. Psychics have confirmed the presence of spirits dwelling in the home and many have actually communicated with them. Since the restaurant opened, staff members have reported several strange experiences. Again, apparitions appear and then quickly vanish, voices and sounds come from nowhere, and glasses will often lift off the bar flying through the air by themselves. On other occasions, doors are said to lock and unlock by themselves, lights inexplicably turn on and off of their own free will, and the piano bar often plays when no one is near. 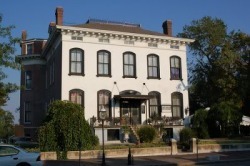 Said to be haunted by several members of the Lemp family, there are three areas of the old mansion that have the most activity -- the stairway, the attic, and what the staff refers to as, the "Gates of Hell" in the basement. It is this area of the basement that used to be the entrance to the caves running below the mansion and the brewery. The plantation is rumored to have been built on an ancient Indian burial ground, which to some, could explain the heavy concentration of strange activity. It is also said that three union soldiers were shot and killed while attempting to ransack the home during the civil war. The spot where they fell has had a stain resembling blood since that day, that cannot be removed. Some cleaners even claim that they cannot push their mops onto the ghostly stain. There is also a custom that called for all mirrors to be covered after the death of a family member during the days of the Woodruffs. Legend states that one mirror was not covered after the death of Sara and her children and that the Ghosts of Sara and her daughters are trapped within the mirror that still hangs on the wall to this day. 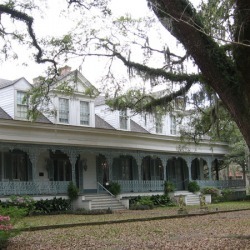 There are other legends and tales of ghosts at Myrtle's Plantation. You can discover them yourself, if you dare. Myrtle's Plantation is now a bed and breakfast and welcomes anyone the chance to spend a night with the Ghosts of Myrtle's Plantation. 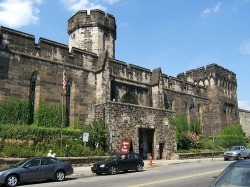 One major paranormal episode reported occurred to a locksmith doing restoration work in Cell Block #4. According to the tale, he was working to remove a 140-year-old lock from the cell door when a massive force overcame him so powerfully he was unable to move.Some believe when he removed the key it opened a gateway to the horrific past and offered the spirits caught behind its bars a pathway out. The man spoke of experiencing an out-of-body state as he was drawn toward the negative energy which burst through the cell. Anguished faces appeared on the cell wall, hundreds of distorted forms swirled around the cellblock and one dominating form seemed to beckon the locksmith to him. The man's experience was so vivid, years after he would shudder in fear when he talked about it. 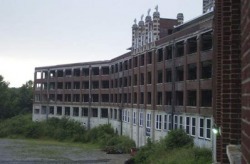 One of the most well known ghost stories about Waverly Hills centers around Room 502. Legend has it a crazy patient murdered a nurse in this room by stabbing her to death. People claim to see the patient's ghost running out the hospital's front door in a white nightgown, screaming at the top of her lungs. While there is no record of a nurse being stabbed in this room, there are records of a nurse hanging herself. She got pregnant by one of the doctors, and since it was very looked down upon she decided to take her life in Room 502. Many people have experienced strange things in that room, and most believe it is her ghost that haunts it. The Death Tunnel is another popular haunted area. One of the uses for this tunnel was transporting dead bodies out of the hospital. Since seeing hearses arrive and take away many bodies on a daily basis would bring down other patients' morale, the hospital staff thought it was best to transport the bodies away in an underground tunnel that the patients couldn't see. Some people believe that many of the deceased patients who left the hospital via this tunnel still haunt it.